A vaulted ceiling makes a strong architectural statement in a home, but mounting a ceiling fan on an angled ceiling requires more than your standard fan installation tools. When buying a new ceiling fan, confirm the fan is compatible with sloped mounting. Many ceiling fans are designed to fit sloped ceilings with angles, also known as a pitch, up to 15 to sometimes 45 degrees. However, if your ceiling has a pitch greater than the slope your desired ceiling fan's in-box mounting kit works with, you will need a sloped ceiling adapter for a proper and secure installation. If already you know your slope and just need to understand which fan brands offer offer in-box and with an adapter, check out the table below. Otherwise, to determine if a sloped ceiling kit is necessary, gather the following materials and use the steps below to calculate the angle of the ceiling. Measure the height of the wall and the highest point of the ceiling. 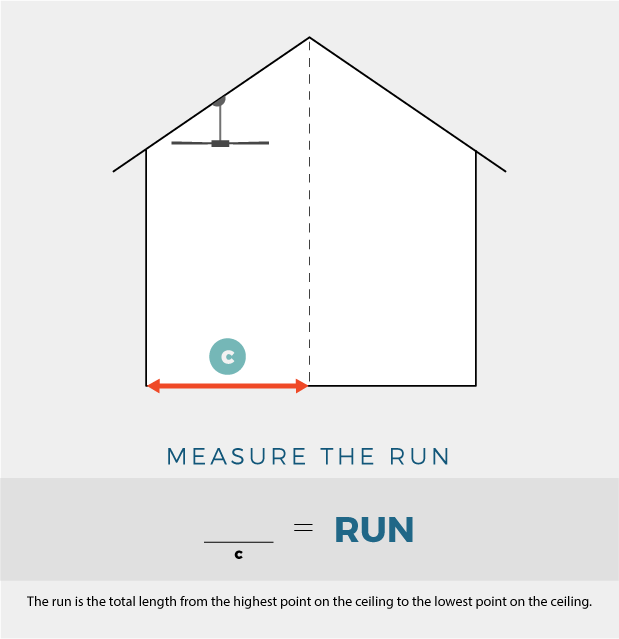 Measure the total length from the wall to the highest point of the ceiling. Use our calculator to find the slope or pitch of your ceiling. Determine downrod length based on installation location height. Using the tape measure, measure the height of the ceiling, from the highest point of the ceiling to the floor. Record this first measurement. Using the tape measure, measure the height of the wall, from the floor to the lowest point of the ceiling (the spot where the wall and the ceiling meet). Record this second measurement. Subtract the wall height from the ceiling height to obtain the rise of the ceiling. Using the measuring tape, measure the distance on the floor from the wall to the location on the floor below the highest point of the ceiling (value A above). 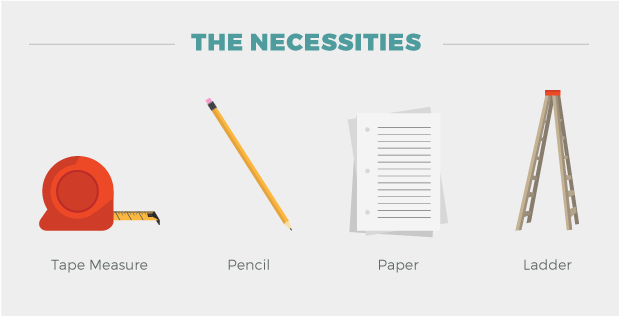 This measurement is the run. 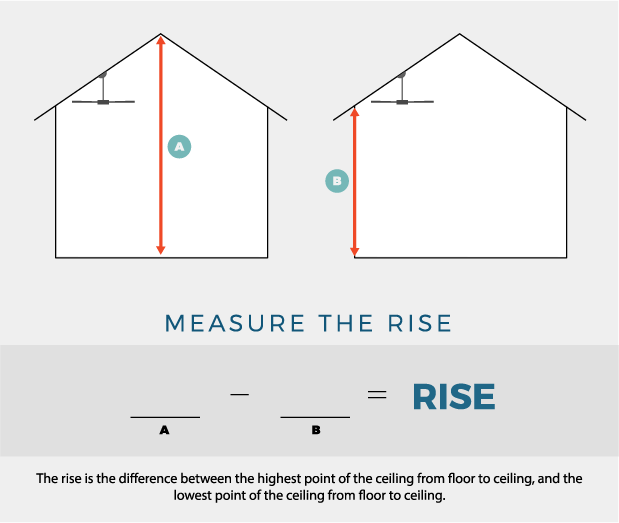 Enter the rise and run measurements into the boxes below to find the slope of your ceiling. After calculating the slope of your ceiling, see the table below to determine which brands offer in-box mounting adapters that work with your ceiling fan slope. Or shop all ceiling fans with downrods to find your fan and refer to the product description to determine if your fan's in-box adapter works with your ceiling or if you need an adapter. When you are installing a ceiling fan on any angled ceiling, you will need a long downrod, or a ceiling fan extender. Most ceiling fan manufacturers include a short downrod in the box, but to install a ceiling fan safely on a vaulted or cathedral ceiling you will need to have a total downrod length of at least 12 inches. A good rule of thumb is: The bigger the fan and/or the steeper the slope, the longer the downrod. 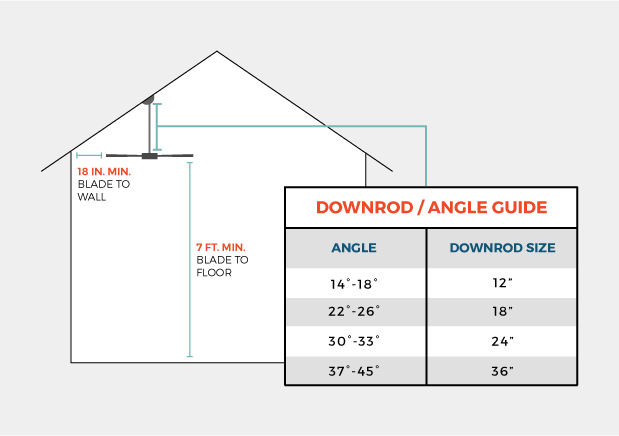 The downrod length is based the slope of your ceiling and the size of your chosen ceiling fan, plus a clearance of 18 inches from the wall. Take numbers you calculated above for the rise and divide that number by 10 to determine the percentage of your slope. From there divide the blade span in inches of your chosen fan in half and add 18 inches. Then multiple the first number by the second number to find the ideal downrod length. For example, if your chosen ceiling fan is 52 inches and your rise is 2.5 feet, your ideal downrod length would be 11 inches. However, downrods longer than 6 inches only come in increments of 6 and 12 - up to 72". Beyond 72 inches, you will need a downrod coupler. We welcome you to contact our ceiling fan experts with any further questions you may have at 1-800-724-5501, or you can click to chat!